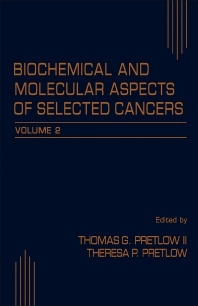 This two-volume work not only includes much of the newer molecular biology research but also important earlier research in this area essential for the comprehensive understanding of the biochemistry of neoplastic diseases. As such it will provide an invaluable source of information for the young investigator. Human cancers, not experimental models of cancer, are emphasized. Biochemists, oncologists, molecular biologists, geneticists, pathologists, cell biologists, and immunologists. K. Barton and C.A. Westbrook, Chronic Myelogenous Leukemia-A Model for the Genetic and Biochemical Basis of Neoplasia. H.J. Kung, C.M. Chang, and R.J. Pelley, Structural Basis of Oncogenic Activation of Epidermal Growth Factor Receptor (EGFR). L.H. Augenlicht and B.G. Heerdt, Colonic Carcinoma: A Common Tumor with Multiple Genomic Abnormalities. T.P. Pretlow, Alterations Associated with Early Neoplasia in the Colon. L.E. Ostrowksi, S.H. Bigner, P.A. Humphrey, and D.D. Bigner, Genetic Alterations and Gene Expression in Human Malignant Glioma. T.G. Pretlow, R.J. Pelley, and T.P. Pretlow, Biochemistry of Prostatic Carcinoma. M.V. Sadi and E.R. Barrack, Androgen Receptors in Human ProstateCancer. C.J. Conti and A.J.P. Klein-Szanto, Biochemistry and Molecular Biology of Skin Tumors. T.G. O'Brien, R.A. Koza, and S.K. Gilmour, Alterations in Polyamine Metabolism in Epithelial Tumors of the Skin. F. Figenbrodt, U. Gerbracht, P.Presek, and R. Friis, Carbohydrate Metabolism and Neoplasia: New Perspectives for Diagnosis and Therapy. R.B. Nagle, Cytokeratin Expression in Carcinoma. B.F. Sloanne, K. Moin, and T.T. Lah, Regulation of Lysosomal Endopeptidases in Malignant Neoplasia. G.L. Nicolson and G. Barnes, Jr., Malignant-Cell Properties Important in the Organ Preference of Metastasis. L.Z. Sun, S.P. Wu, B.L. Ziober, and M.G. Brattain, Role of Autocrine Growth Factors in Cancer Cells.